Our 4 MM corrugated plastic yard signs are the best solution for temporary yard signage. They outlast traditional bag or paper signs by years. They are made from a heavy duty yet inexpensive corrugated plastic material. The step stake that is designed to be used with the corrugated plastic signs is comprised of galvanized steel. The vinyl graphics that are bonded to face of the sign are high quality and waterproof vinyl graphics. Let our talented graphic artists create a layout for you! Our easy step by step order form allows you to add text, colors and type styles. We then take that information and generate a proof for you to review. You are allowed unlimited changes to the layout of the signs and once you are satisfied with the final product, we ship the signs to you within 48 hours. Please view our ordering instructions or place an order. All orders are shipped out within 48 hours of artwork approval. If you would like to place a large order and would like to know if you qualify for quantity discounts or if you have a layout in mind and would like a quote, please e-mail us your request. 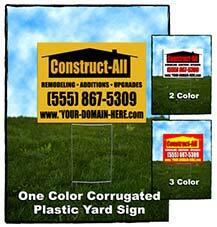 Our corrugated plastic yard signs are perfect for contractor job sites or for the realtor on the go. They measure 24"x18" and come with a step-in stake for easy installation. 1. Select the quantity of signs you would like to purchase. 7. Enter the third line of text. 8. Enter the fourth line of text. 9. Click on the Add to Cart Button to Check out. A proof of the design for your corrugated plastic yard signs will be generated for you to preview or make changes to. The preview of your corroplast signs will be sent as an attachment to your e-mail address within 24 hours. You can also enter special instructions you may have regarding the layout of your signs on the next page. You can add your company logo or photo to any sign for an additional fee. This form is for a simple sign based on the information you provide us. If you have an existing layout or would like to add a piece of clip art or your company logo, please e-mail us your images and ideas for a quote. You can also DESIGN YOUR SIGN ONLINE by using our Interactive Sign Designer. Let our talented graphic artists create a layout for you! Our easy step by step order form allows you to add text, colors and type styles. We then take that information and generate a proof for you to review. You are allowed unlimited changes to the layout of the signs and once you are satisfied with the look of final product, we ship the signs to you within 48 hours. Please view our ordering instructions or place an order. All orders are shipped out within 48 hours of artwork approval. If you would like to place a large order and would like to know if you qualify for quantity discounts or if you have a layout in mind and would like a quote, please e-mail us your request.